Courtyard Gallery Courtyard Gallery carries the work of over over 20 local artists. 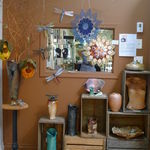 Come in and see our fine art as well as gifts handmade by artists. Enderby, V0E1V0, 907 Belvedere St.